Posted by thetickthatbitme in Diagnosis, TBI Facts. 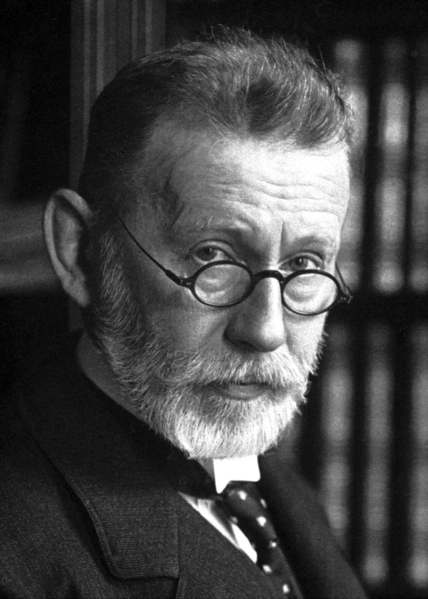 Paul Ehrlich (1854-1915). Image via Wikipedia. 1. Ehrlichia is transmitted through the bites of lonestar ticks and deer ticks. If you’ve had another infection carried by these ticks (like Lyme Disease), your doctor should have had you tested for Ehrlichia (or maybe you’ll be asking him/her to test you after reading this post?). 2. Symptoms of Ehrlichiosis include: fever, headache, chills, malaise, muscle pain, nausea / vomiting / diarrhea, confusion, conjunctival injection (red eyes), and rash (in up to 60% of children, less than 30% of adults). When it goes untreated (or improperly treated), complications can include breathing problems, bleeding disorders, and death (1.8% of cases). 3. Ehrlichia is effectively treated with doxycycline in both adults and children. The CDC recommends a 7-14 day course. 4. Your doctor shouldn’t wait for your test results to come back before prescribing you doxycycline. If your doctor thinks you might have Ehrlichiosis, he/she might order a PCR, a blood smear, or an IFA (antibody test). These tests can take a few weeks to come back, and in that time, you could get very, very sick. In addition, a negative result on any of these three tests does not rule out the possibility of infection. Often, in the first 7-10 days you are infected, you will test negative. For more information about these tests, take a look at the Ehrlichiosis fact sheet. 5. Ehrlichia can be easily misdiagnosed as one of two other infections. It’s a rickettisial disease, which means it’s in the same family with A. phagocytophilum and Rocky Mountain Spotted Fever (RMSF). Sometimes the rash patients get with Ehrlichia looks a lot like the rash patients get with RMSF. 6. It may be possible to contract an Ehrlichia infection through a blood transfusion. The CDC has not been very vocal about it, but it’s on their website. Fun fact: “Ehrlichia chaffeensis has been shown to survive for more than a week in refrigerated blood.” If you’ve had an Ehrlichia infection, it’s probably not a good idea for you to be a blood or organ donor. 7. There’s a newly identified species of Ehrlichia in Wisconsin and Minnesota. It doesn’t have a fancy species name yet, so scientists refer to it as Ehrlichia Wisconsin HM543746 or Ehrlichia muris-like (EML). This one is carried by deer ticks. If you live in one of these states and your doctor is not so hip to the new infectious disease research, he or she may have told you that you didn’t need to be tested for Ehrlichia because “we don’t have that here.” (I hate it when doctors say that! )Hopefully there will be a commercially-available, species-specific test for this soon. For now, my guess is that physicians in Wisconsin and Minnesota who suspect Ehrlichia infection are ordering tests for E. chaffeensis and E. ewingii. Got an Ehrlichia story you’d like to share? Shoot me an e-mail. Posted by thetickthatbitme in Peer-Reviewed, Tick-Lit, Treatment. This is NOT what I mean when I say “Tick-Lit.” Image via Wikipedia. Today is Tuesday, and I’ve made an executive decision that from now on, every Tuesday I will be covering peer-reviewed research related to tick-borne infections. We in academia call this a “review of the literature,” even though it’s not what normal people think of as literature–no Shakespeare, just dry prose littered with scientific jargon–which is why most people don’t want to read it. Lucky for you, I am a super-nerd and enjoy this kind of reading, at least when it’s about TBIDs (tick-borne infectious diseases). I’ve even come up with an affectionate name for it: “tick-lit”. So every Tuesday from here on out will be Tick-Lit Tuesday, the day on which I read the literature so you don’t have to. Enjoy! Today’s question: Does prophylaxis work for tick bites? While a lot of patients with tick-borne infections don’t remember a tick or a tick bite (which is why it takes so long to get diagnosed), there are also people who do notice being bitten and go to a doctor right away because they are concerned about TBIDs. So what happens to these patients? I’ve heard stories from patients with TBIDs, particularly patients with Borrelia burgdorferi (Lyme) and Borrelia hermsii (Tick-borne Relapsing Fever), about how when they went to a doctor within 48 hours of being bitten, they were told “Oh, we don’t have Lyme in this state, so you don’t have to worry.” Following this logic, ticks carrying Borrelia burgdorferi must be so smart that 1) they know which bacteria they are carrying; 2) they know which state they are in; and 3) they have the decency to respect state lines. I can really imagine a deer tick saying, “Oh, no, I can’t go over there. I’m a California tick. They don’t let dirty ticks like me out of California.” I suppose some doctors imagine that there is some kind of tick parole system that keeps them from traveling anywhere where the CDC and state health departments have not documented them to exist. Some of these delusional doctors probably can’t be reasoned with, but what about doctors who want to do the right thing? What should they do when a patient comes to them within 48 hours of a tick bite? One of my favorite tick-lit studies is one that was published in the New England Journal of Medicine way back in July 2006. The study took place in Israel, where Ornithodoros tholozani ticks infect people with a bacterium called Borrelia persica. Borrelia persica, like Borrelia hermsii, causes Tick Borne Relapsing Fever (TBRF). You can think of Borrelia persica as B. hermsii‘s brother. The researchers wanted to find out whether prophylaxing soldiers (giving them antibiotics right away) who had recently been bitten by ticks would prevent the infection from spreading and causing the symptoms of TBRF. Here’s how they did it (Methods). They studied 93 healthy soldiers with suspected tick bites. Some of these people had evidence of a tick bite (like a rash) and others didn’t, but had been in the same places that the people with bites had, so they had the same risk of exposure. They randomly picked half of the soldiers who would receive antibiotics (Doxycycline for 5 days), and the other half would receive a placebo (which means they would think that they were taking antibiotics, but they were really taking a sugar pill). The study was double-blind, which means that neither the soldiers nor the researchers knew which patients were given the real antibiotics at the time of the study. This makes the study more credible. All 10 cases of TBRF identified by a positive blood smear were in the placebo group of subjects with signs of a tick bite (P<0.001). These findings suggested a 100 percent efficacy of preemptive treatment (95 percent confidence interval, 46 to 100 percent). PCR for the borrelia glpQ gene was negative at baseline for all subjects and subsequently positive in all subjects with fever and a positive blood smear. Seroconversion was detected in eight of nine cases of TBRF. PCR and serum samples were negative for all of the other subjects tested. No major treatment-associated adverse effects were identified. In English, this means that 10 of the 46 people who did not get treated with antibiotics got sick with TBRF, and their blood tests showed that they were making antibodies to Borrelia persica. (Their PCR test (a DNA test) was also positive for the borrelia gene.) However, none of the 47 people who were treated with antibiotics developed any symptoms of TBRF. When their blood was tested, it was negative for antibodies to Borrelia persica and their PCR was negative for the borrelia gene. That means that prophylaxing with Doxycycline prevented 100% of cases of TBRF (Borrelia perica infection). Doxycycline Structure. Image via Wikipedia. Doxycycline 3D structure. Image via Wikipedia. The 2001 study was conducted in an area of New York with a high incidence of Borrelia burgdorferi (Lyme) infection. Like the Israeli study, it was also a randomized, double-blind, placebo-controlled trial, but unlike the Israeli study, they only gave patients a single dose of doxycycline. The results? One out of the 235 people treated with doxycycline got Erythema migrans, the bull’s-eye rash that indicates a Borrelia burgdorferi infection. In the placebo group (people who didn’t get antibiotics) 8 out of 235 developed the rash and tested positive for infection. Their conclusion: a single dose of doxycycline can prevent Lyme if given within 72 hours of the tick bite. If these two studies are not convincing or current enough, the doctors from the Israeli Medical Corps published another study in 2010. First, they inform us that “Since 2004, the Israel Defence Forces (IDF) has mandated the prophylaxis of tick-bitten subjects with a five-day doxycycline course.” (That has me thinking the Israelis are pretty smart.) Just to make sure they were doing the right thing, in this study, they decided to analyze all the tick bite and TBRF cases in their records from 2004-2007. Of those screened, 128 (15.7%) had tick-bite and were intended for prophylaxis, of which four TBRF cases occurred-3.13% attack rate compared with an expected rate of 38.4% in these bitten individuals without prophylaxis (RR = 0.08, number needed to treat = 3). In all cases in which screening and prophylaxis were provided within 48 h of tick bite, complete prevention of TBRF was achieved. No cases of Jarisch-Herxheimer reaction (JHR) was recorded. What does that mean? Only 4 of the 128 people who were treated with doxycycline developed TBRF, a rate of 3.13%. The expected attack rate was more than 10 times that, 38 percent, so without the doxycycline policy, it would likely have been 48 people with TBRF instead of 4. One more thing. There was a reason those four people got sick: they were given the doxycycline later than 48 hours after being bitten! How does this research affect you as a patient who has been bitten by a tick and contracted an infection or as a patient who could potentially be bitten by a tick in the future? The research shows us that, if treated within 48 hours with 5 days of Doxycycline, most–if not all–cases of Borrelia infection and resulting symptoms can be prevented. If you could get an appointment with an infectious disease specialist who recognizes this fact within 48 hours of being bitten, you could probably avoid a lot of potential suffering. The problem is that to see a specialist, you usually need to be referred by your primary care doctor. Some of us can’t even get an appointment to see our primary care doctors within 48 hours, and some of the primary care doctors don’t even know how to spell Borrelia (no offense to primary care doctors who can spell it), let alone diagnose it with a simple blood test. And most of them certainly don’t know that the best thing to do would be to prophylax you with doxycycline. Let’s put the numbers in perspective. In 2010, the CDC reported over 20,000 confirmed cases of Lyme (Borrelia burgdorferi) and an additional 10,000 probable cases. The CDC’s number of cases (which I believe, as with burgdorferi, are severely underreported) for 1990-2011 for Borrelia hermsii (TBRF) is 483. If 35% of those Borrelia cases had been prevented with prophylaxis, that would mean 10,669 fewer sick people. If you’ve been diagnosed with a tick-borne illness, make sure that every one of your doctors knows it, even the ones you don’t like and the ones you don’t go to very often. All doctors, not just infectious disease doctors, need to be aware of how prevalent these infections are. If you are bitten by a tick, insist that your primary care doctor prophylax you with doxycycline for five days. You can even print out these PubMed article abstracts and bring them to your appointment. Many doctors can be reasoned with, and if they won’t listen to you, sometimes they’ll listen to the New England Journal of Medicine. If you are bitten by a tick, try your best to save the little beast. You can store it in an old prescription bottle or a jar. (Labs like Quest Diagnostics also distribute collection containers to some doctors’ offices.) Inform your doctor that you are brining the tick to your appointment and you want to have it tested. Having ticks tested helps with more accurate CDC reporting about which areas have infected ticks. Getting the tick tested doesn’t mean that you don’t need to get tested. The tick testing takes longer than the people testing. On the off-chance that prophylaxis doesn’t work for you, you’ll need to get more treatment if you test positive. As always, the best way not to get a tick bite is not to be in areas where ticks live and not to be around animals that carry ticks. Follow tick-exposure prevention best practices. This includes keeping your home and yard free of mice and rats (on which the hermsii-carrying ticks feed) as well as deer (on which the burgdorferi-carying ticks feed). That’s all for Tick-Lit Tuesday. Stay informed and stay well!